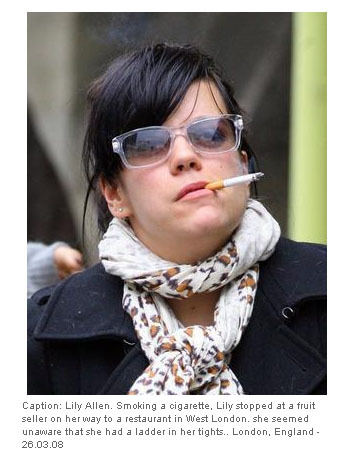 It reads as follows, typo and all: "Lily Allen. Smoking a cigarette, Lily stopped at a fruit seller on her way to a restaurant in West London. she seemed unaware that she had a ladder in her tights." I realize that Lily Allen is the second most prominent British indie chanteuse right now and that only by virtue of comparison to Amy Winehouse does she get to be "the put-together one." However, even the most sugar-filled pop tart could surely realize that she'd somehow gotten a ladder dropped into her tights, no? Spencer to the rescue: When your speaking British English, a "ladder in one's tights" means a run in one's stockings. Now I know, I suppose. But the original interpretation of that phrase is infinitely funnier.